I had the pleasure of spending time with Shawn Walker in Ethiopia in 2015 for the Pan African Workshop, where he shared with me stories about his work over 5 decades. I am now looking forward to moderating Telling Our Stories: Photographers of Spirit of Community on Sunday January 21, a discussion featuring Shawn along with photographers Henry Adebonojo, Tau Battice, and David Vades Joseph. The Steven Kasher Gallery is also currently presenting Shawn’s first ever solo exhibition! The exhibition surveys Walker’s evolving and wide-ranging work from the 1960s through the 1990s and proposes his importance to the photography and art of our time. Embracing and melding abstraction, surrealism, social documentary and street photography, Walker’s work challenges the myth of a singular African-American aesthetic. Each body of work marries transcendental spiritual philosophies with contemporary urban representations of African heritage. From his 30 year study of parades to his on-going series on shadows and reflections, Walker’s work is connected to profound rituals, ceremonies and masking found in African culture. Shawn Walker is an integral part of the rich history and continuing legacy of the Kamoinge Workshop, the seminal black photography collective finally having its moment in the spotlight. As a founding member of Kamoinge, Walker studied photography with Roy DeCarava, Herbert Randall, Adger Cowans and Louis Draper. Walker also considers Charles White, Romare Bearden and Jacob Lawrence to be his artistic forebears. Walker was the Picture Editor of the Black Photographer’s Annual from 1973 – 1980, the first annual dedicated to the work of these artists. With a career spanning half a century, Mr. Walker is just now having his first retrospective in a show opening this week at New York’s Steven Kasher Gallery. The images reflect his belief that “photography has always been magic” for him, ever since his teenage years in Harlem, with his uncle, a photographer, being an early influence. He pursued his passion at Benjamin Franklin High School in East Harlem, which had a photography program and darkroom. Mr. Walker’s photographs are aesthetically rich, even as he documents the lives of regular people engaged in everyday activities and rituals. His images reveal the paradoxes and nuances in his subjects’ lives: a woman in a stylish hat asleep on the steps of a Harlem tenement; the words, “Black Power,” scrawled across a run-down Romanesque style façade; children in Halloween masks standing in darkened and ominous doorways; a Batman logo, hovering apparition-like on a paint-splattered wall; the ramshackle door of a church marked with a cross; and regal women in evening gowns seated on parade floats. Mr. Walker’s layered and complex images are influenced by a range of artists and photographers who, in addition to Mr. DeCarava, include Charles White, Romare Bearden, Jacob Lawrence, Henri Cartier-Bresson and Minor White. Above all, he sees himself as a latter-day surrealist, pushing the formal and conceptual boundaries of photography. “I’ve always been taken by Surrealism,” Mr. Walker said, fascinated by its penchant for teasing out the extraordinary in commonplace things and situations. Mr. Walker’s interest in Surrealism includes its popular manifestation in film noir, especially the raking shadows and histrionic lighting of the stylish Hollywood crime dramas of the 1940s and 1950s. 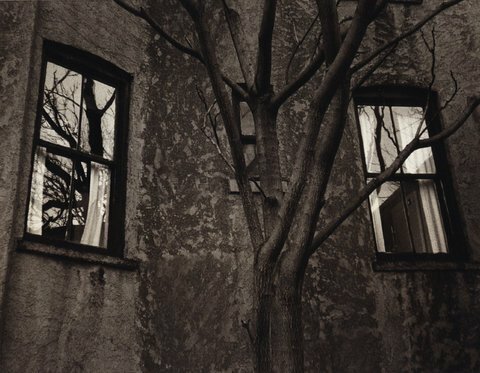 His photographs resonate with these flourishes, transforming the cityscape into multifaceted and haunting pictures: a mysterious pointing hand, silhouetted against a light-dappled street; the face of a child in a metallic party hat, illuminated by an intense streak of light; the roof and turrets of a Harlem building encircled by dramatic sky; or dismembered mannequins in a Harlem store window, their lower torsos discreetly draped in rags. In these images, Mr. Walker liberates his subjects from stereotypes and invisibility, no more so than in his continuing “Parade” series. For 30 years, he has photographed ethnic parades, focusing on their cultural and ceremonial details, from clothing and costumes to marching bands and elaborate floats. In their inclusiveness and range, these photographs track the similarities and differences of public celebrations of identity across racial lines.